The appearance of Vanna the Moose at Mount Van Hoevenberg (MVH) presents the perfect opportunity to discuss another prevalent character trait found in many who live the Adirondack Lifestyle. Vanna, the two-year-old female moose currently hanging around the Olympic facility's bobsled run at MVH, is a very tenacious creature. She appears to prefer hanging around humans and man-made things over doing her moose ruminating in the woods, and she won't give it up. This young cow is the very same filly who was caught visiting downtown Saratoga Springs and the horses at the Saratoga Race Track in June 2009. At that time, the resident biologist and crew "relocated" her to a quiet and remote area of Saratoga County. Lonely and bored with the forest life, she strolled back to civilization and into the Queensbury Mall parking lot five months later. It was presumed she was at the mall shopping for accessories to match the lovely, beige, numbers bedecked DEC earrings (ear tags) she received during her earlier relocation. The next relocation effort found her dropped off in a very remote, but very moose habitable, part of the High Peaks Wilderness Area, outside of Lake Placid. True to form, five months later she is bored with the woods and has found her way back to civilization. This moose obviously wants to be around civilization and she keeps at it tenaciously. Now we now know the Adirondack Moose shares a character trait with its cousin, the notoriously tenacious Adirondack Black Bear. The resident biologist tells us Vanna has not reached breeding age, which is 2.5 years old. He says there are now enough moose in the Adirondacks that the likelihood of a male 'running into her' this fall is high. 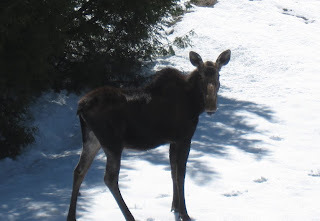 Which means if everyone leaves her alone and she sticks around, we could have a baby moose in the neighborhood next year. 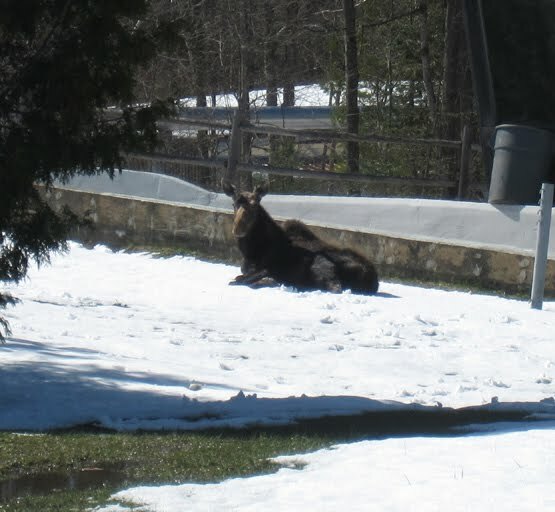 Naturally, this wouldn't be an Adirondack Lifestyle moose blog post if I didn't remind everyone that moose are quite dangerous, despite their goofy appearance. Remember the moose whisperer's famous words, "They are not friendly, they are unafraid."